Did You Catch the Rolling Stones on Last Night’s ‘Mad Men’? The AMC series informs us that the band was selling out as early as 1963! So, as SPIN mentioned last week, the ’60s have made it to Mad Men, meaning the suits at Sterling Cooper Draper Pryce are finally starting to pay attention to the counterculture. Last night, Heinz asked Don to get the Rolling Stones, fresh from the release of Aftermath, to sing, “Heinz, Heinz, Heinz is on my side” to the tune of “Time Is on My Side.” What a bunch of squares, right? Turns out: not really. Yes, Don and Harry loitered backstage, oblivious to the moment they were a part of, unlike the viewing audience — hindsight is one of the most voyeuristic pleasures of the series — but when a young fan echoed the teasing of Don’s young wife and told him that he was a fool to think that the Stones would ever shill for beans, Don shrugged and said that they did it for Rice Krispies three years ago. Huh? This was a bigger surprise than a bigger Betty. 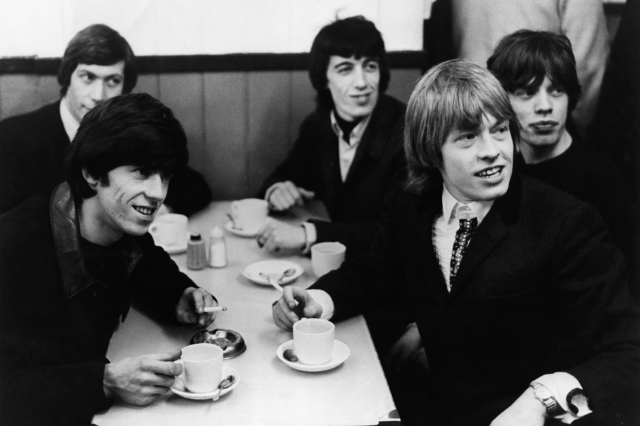 But creator Matt Weiner never gets his facts wrong, and sure enough, in 1963, the Stones recorded the below commercial, which only aired in the U.K. Maybe the cereal benefited for being noisy — or, as Mick sings, “Wake up in the morning, there’s a crackle in your face! ” — but beans are not without their own, arguably more confrontational sound effects. Heinz would have been the more rock star move.